When people like me say that the American cinema was never better than it was in the 1930s, this is exactly the kind of thing we're talking about. I mean, when you get that image above, what more could you ask for, really? But this is a movie that combines the low-class working-man picture with the gangster genre with the Hollywood satire, throwing in animal anarchy (seen above), car chases, shootouts, car crashes (and not the kind where they cut away! ), and more star charm, via Cagney, in 76 minutes than most films give you in 120. The 1930s were really Hollywood running wild with a machine that refused to stop making money, and gave them license to do just about anything, especially in the Pre-Code heyday. So when the Film Forum in New York, upon announcing an entire four-week series dedicated to the films of 1933 (anyone want to put me up for a month? ), calls it "Hollywood's naughtiest, bawdiest year," they aren't kidding. Recapping the particulars of the plot would give away too much of the fun, but this is Cagney at his purest, giving the kind of slack only a recently-crowned star could have earned to totally cut loose, with all the bravado in the world. While he could play self-doubt with the best of them, there's nothing like seeing him on top of the world (so to speak), and this picture gives him at least two kingdoms over which to reign, never mind his overarching charm with the ladies. Immediately following his self-made jungle, we get a scene in which he takes the lady pictured above out to dinner, which is in turn followed by him taking her back to his place, and even them finding another woman in his bed isn't enough to turn the first lady off completely. 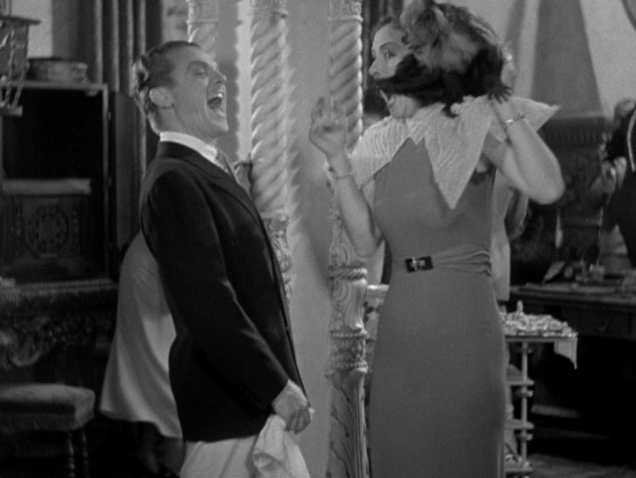 At every turn, Cagney comes out on top, and even when he slips up, he can't stop laughing at the absurdity of it all. After all, he's a hustler, and he's hustled his way out of worse jams. Lady Killer will indeed play at the Film Forum during its series, which is just welcome happenstance as I knew after seeing this picture last night that I'd write about it, and only happened to wake up to the Forum's announcement. It's on a triple-bill of Cagney flicks, including the also-enjoyable Picture Snatcher and the has-yet-to-be-seen-by-me-but-sounds-like-a-blast Hard to Handle. The three actually also represent a great opportunity to acquaint oneself with three of the best directors Warner Brothers had in its stable in those years - Lloyd Bacon (whose Footlight Parade, also playing there, is a joy), Mervyn LeRoy (whose Gold Diggers of 1933, ALSO playing, is one of my twenty favorite films of all time), and Del Ruth himself (who, in addition to this, directed Cagney in Taxi!, one of my favorite discoveries from last year). Like I said...anyone want to put me up for a month?